In 2010, SCOTUS ruled on Citizens United v. Federal Election Commission which stated that corporations and unions could make unlimited contributions to political candidates and this ruling opened the door to Super-PACs that allowed for corporations, unions and individuals to make unlimited contributions to political causes (but not directly to candidates). Ever since that time, The Left has been upset about the amount of money flowing into Conservative candidates’ coffers and Super-PACs. Think Progress equates the SCOTUS decision on Citizens United with election buying. Leftists view Citizens United as equivalent of a corporate takeover. Liberals believe that money from conservative donors is given by Crankpots and those who have a delusional view of the world. Never mind that millions of dollars are being funneled into the Obama campaign from Union Thugs like the SEIU. It’s hard to believe the Left is complaining about how much money Romney has raised when Obama’s war chest is much larger than Romney’s, which is shown in the following graph from Open Secrets. It is true that Romney has raised more money in his Super-PAC (Restore Our Future) than Obama has raised in his Super-PAC (Priorities USA Action) – to the tune of $56.5 million to $10.6 million as shown in the following Open Secrets link. 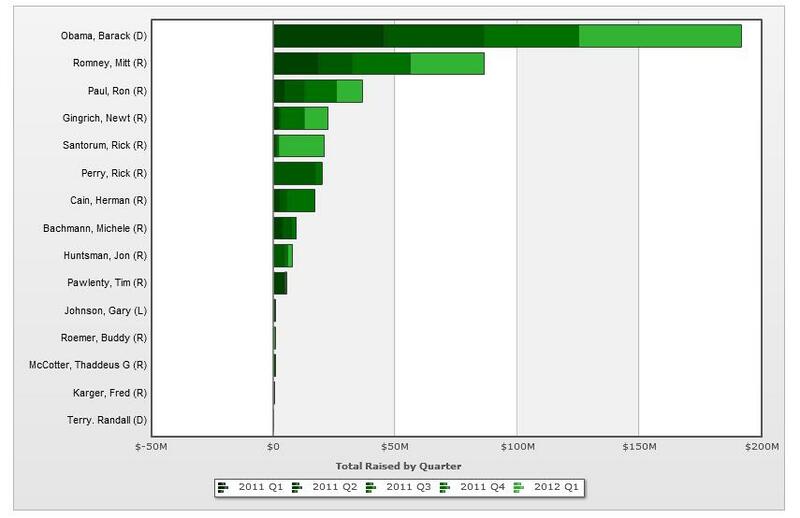 It is also true that Obama still has more cash on hand in his personal account than Romney to the tune of over $106 million, which is shown on the table in this link ($115.2 million for Obama and $9.2 million for Romney). I really don’t understand the wailing and gnashing of teeth from the Left when Obama has more money than Romney but I suppose facts have never stood in the way of a good Leftist meme. In my viewpoint, limits on campaign contributions should be eliminated and I came to this position because I believe campaign donations equate to speech and therefore should not be limited. If we start limiting the dollar amounts given to candidates (as we do now) then what else should we limit? 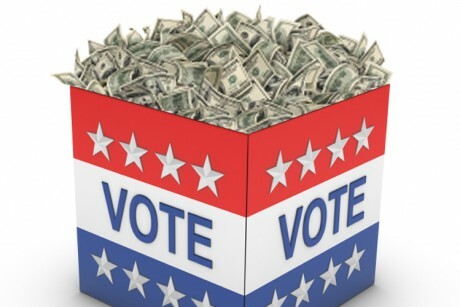 If we assume that a disproportionate amount of campaign donations give one candidate an unfair advantage over another then we must assume that this advantage comes from the added exposure that money buys (advertisements, get out the vote effort, staffing, etc.). But a candidate’s exposure also comes from the main stream media, blog sites, Twitter, Facebook, bumper stickers, lawn signs and conversations around the water cooler at work. Should we start limiting that exposure as well? Do we put limits on the number of news stories that TV stations and newspapers devote to the various candidates so that one candidate doesn’t get more ‘positive’ news stories than his rival? Do we limit or censor activity on Social Media to ensure there isn’t an unfair advantage to a candidate that is more popular? Do we ensure there are equivalent numbers of bumper stickers and yard signs in a particular geographic area? Do we limit the political conversations at work so that one candidate won’t get more exposure than his opponent? Once we start limiting campaign donations, in an effort to limit exposure, then we must look into other areas which impact a candidate’s exposure. If a candidate is truly popular then that candidate will receive more campaign contributions because more people resonate with that candidate’s ideas and want to support him. Is the fact that a winning candidate had more campaign contributions than his rival a result of all the money flowing into his campaign or was the larger amount of campaign contributions a result of the candidate’s popularity? This is a classic ‘chicken and the egg question’ and I lean more to the latter (campaign donations are a reflection of the candidate’s popularity). I don’t care if Obama raises $1 trillion for his campaign and his commercials are on TV 24/7, I will still not vote for him. No matter how much money Soros, the Hollywood elite and unions give to Obama, the added exposure from that money will not alter my vote and I suspect there are those on the Left who would say the same thing about Romney. What we are really talking about is persuading the middle and I still have faith in the American people to avoid deception from a barrage of campaign advertisements and I think they will vet the candidate’s positions on their own and not vote based solely on TV advertisement. Eliminate this limit on Free Speech and allow companies, unions and individuals to contribute unlimited amounts to local, state and federal candidates. Obviously, the reason to limit contributions, is so that governments can’t be bought and paid for by the highest bidder. Seems pretty simple to me. And limiting contributions have NOTHING to do with freedom of speech. That is the most absurd, idiotic thing I’ve ever read. Oh, and if corporations are people, then they should be made to answer to the same laws, rules, reguLtins and tax laws as people. And even the same bankruptcy laws. But they don’t. Big business always wants, wants, wants. But doesnt want to contribute to the society and infrastructure that they take advantage of.